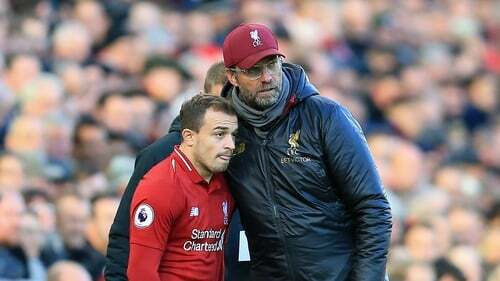 Liverpool manager Jurgen Klopp hopes his proactive action has defused a potentially-explosive situation regarding Xherdan Shaqiri after leaving the forward behind for the Champions League tie against Red Star Belgrade. The 27-year-old, whose parents are Kosovar-Albanian, was born in the former Yugoslav city of Gjilan which is now part of Kosovo, a state Serbia still refuses to recognise despite its declaration of independence in 2008. Shaqiri angered Serbia fans in a match at the World Cup wearing boots featuring the Kosovo flag and making an 'Albanian Eagle' celebration and was certain to receive a hostile welcome in Belgrade. Klopp considered the local politics when he took a pragmatic decision to leave the player at home to ensure their visit remains a "football story". Asked whether the Swiss international accepted the decision Klopp said: "Yes. I took a lot of times in my life a decision about playing squad and so far the players always accepted it. "We need to cool the situation down. We cannot clarify that situation tonight and it's not our job. People here will know better how the situation is. "We are in Serbia, we respect that 100 per cent. That's the world, how it is. Politics always has always influence on life, on the life I live at least, and that's how it is. "But we are not here for that, we are here to play football. We tried to make sure we can be focused on football. "It could have been a story but we didn't want to have a story besides a football story." Klopp was clearly aware of the sensitivity of the issue, fielding a number of questions on the issue and, at one point, stressing to the translator to relay his words in their entirety rather than provide a condensed version as he was keen to get his message across without misunderstanding or misinterpretation. A hostile atmosphere is guaranteed - although not half as hostile as if Shaqiri had travelled - but Klopp is confident his players can cope. "We have to be strong tomorrow again football-wise. We are from Liverpool, we know how big the influence of atmosphere can be," said the Reds boss, whose side comfortably won 4-0 against Red Star at Anfield a fortnight ago. "The only way I know to cool the atmosphere down is to play really good football. That's what we have to try. To be ready for a fight, ready for a big game. "We are not most experienced team in the world in this part of the game but in the last three years we twice into a final. We are used to difficult atmospheres, difficult situations. That's what we have to be tomorrow."